A couple of weeks ago I was fortunate enough to come across some images online of one of 15mm.co.uk's most popular fantasy releases of this year. Attar the ghoul dragon who is almost unique in the world of fantasy as a mortal and yet necrotic creature. These images we painted by the talented Rhaksha and I asked her if we could feature them officially. Tickled pink I was by her permission! There is a small image above but click on the one below for it full size to get a good look. I also have an account on the method of painting below as well as that saliva dripping from Attar's jaws! “When I started to paint Attar the overall look I wanted was of a vaguely necrotic dragon; this would fit with his Ghoul Dragon moniker. I base coated the whole beastie with Army Painter (AP) Necrotic Flesh and then made a wash with two parts AP Necrotic Flesh and one part Vallejo (VJ) Dark Flesh. The reddish hue of the dark flesh shades the greenish basecoat very nicely. Once dry I highlighted the flesh from pure necrotic flesh up to extreme highlights of AP Skeleton Bone. I then had a bit of a decision to make which would drastically affect the look. What colour to paint his scales? I could go red or red-brown and have an aggressive looking monster. Alternatively I could go green which makes a more malevolent, but equally aggressive Dragon. I made my choice and base coated the scales with AP Greenskin, carefully avoiding splashing paint onto his finished skin. I then washed the scales with a 2:1 mix of AP Dark Tone and AP Greenskin. I really like mixing basecoat colours with a shade wash as it offers a much softer blend than pure AP wash usually affords. I decided not to highlight the scales as I thought the colour was fine as it was. I dotted AP Greenskin along the margin of his scales and skin so the line between them was not so stark. I painted his wing phalanges with AP Greenskin and washed them with the shade mix above. Then I made a glaze using VJ Glaze mix and a tiny amount of AP Greenskin and washed his wing membranes ensuring that the darker colour was concentrated towards the 'hands'. I picked out his claws with AP Leather Brown and highlighted them once with 1:1 AP Leather Brown and AP Skeleton Bone. Above all else, his face was the most important thing to get right. I washed the recesses of his features with AP Soft Tone to bring out the detail. Then I experimented with a hodge-podge of VJ Dark Flesh, AP Dragon Red and AP Tanned Flesh until I got a nice rich ‘inside of mouth’ colour. I painted his throat, gums and tongue with the colour and then painted his teeth with AP Skeleton Bone. I painted his eyes with AP Demonic Yellow and used AP Matt Black to carefully paint the wicked reptilian eyes. I then washed the whole eye socket with a mix of AP Dragon Red and AP Soft Tone, ensuring the evil yellow eye was still bright. Once based (using AP Leather Brown and AP Strong Tone) I sealed the paint job with a clear matt varnish spray. 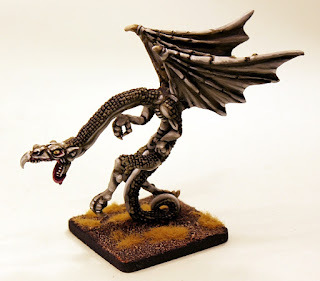 If you liked Rhaksha's vision of HOT100 and if you fancy contacting her on commission to paint up your miniatures to this great and thoughtful level then use disturbedearthgames(at)gmail.com and she will respond to you from there. Here is our own version of HOT100 Ghoul Dragon as painted by its designer Sam Croes. You can go to this monster HERE on our website. Sam painted our version using our Pebeo Studio Arcylics range of paints which offer superb coverage and value. You can see them HERE.